Hi, I have been running Defraggler version 2.21, and wanted to update to the new version 2.22, so I bought it. I uninstalled version 2.21 restarted my PC & installed version 2.22. The moment I activated it & it opened it detected my HDD drive as SDD, & the program just locked up. windows had to close it. So I uninstalled it restarted my PC several times & reinstalled it, same thing, it detected my HDD drives as SSD, & again the program locked up. I then uninstalled it again and put my old version back in, reactivated it, & it works fine, detected my drives as HDD. I am running windows 7 professional 64 bit. service pack 1, on a Acer Desktop. Does anyone have this same problem, or does anyone know a fix, as I have sent Piriform 4 emails & not heard anything back. Maybe I will have to file a claim to get a refund, as I sure can not run the new version 2.22 DOES ANYONE HAVE THIS SAME PROBLEM ?? OR A FIX ???????? I have pointed Admins to your post. I am using free Defraggler. It is incorrectly identifying my hard drive as an SSD. And showing that my hard drive is 33% fragmented, which is impossible because I check it weekly and keep it under 10%. I am running Windows 7 Pro 64 bit. Samsung laptop. I went back to earlier version, it shows hard drive correctly, but says I am 33% fragmented now!! By the way, SPECCY has same problem!! The latest version shows incorrectly that I have an SSD!! I am running full defrag on latest version of Defraggler. I hope that I am not messing up my hard drive! Note: Unlike DJ, the program has not hung up. Its defragging....14 hours to go. Watch this space! Defraggler is really screwed up!!! I ran for 3 hours, was 45% completed and went from 33% to 28% fragmented. I had to shut down my computer and run out for a while. Two hours later, I ran Defraggler when I opened computer, and when started up it showed 43% fragmented!! What the hell!! Now it shows 40% completed and says its 39% fragmented! Now I am considering uninstalling Defraggler altogether. I finally finished a full defrag. I then closed program, and immediately re-opened it. Ran Analysis - its show 41% fragmented now. I don't recommend using Defragger. It's got problems. And, of course, it wrongly identifies my hard drive as an SSD. Opened the Windows Disk Defragmenter that comes standard with Windows 7 Pro. I ran the Disk Defragmenter. It showed 0% defragmented cells. ZERO! WTF!! You tell me what's wrong with Defraggler! Windows defragger doesn't see things that defraggler does, for instance locked system files and hybernate and (I think) system restore points. I believe, though haven't used defraggler in a while, you can disinclude some of these in defraggler's settings. I am having the same problem as D J and Robertlaw. I have been a long-time user of Defraggler Pro, and the application has run without incident for years. This upgrade spooked me from the beginning when it claimed that my WDC HDD is a SSD, which it most definitely is not. I have not run the app since the upgrade, and based on the comments above, I'm glad I didn't. My OS is Windows 7 Enterprise SP1, fully patched, running on a Lenovo T430 laptop with 16 GB RAM and a WDC 1 TB HD. If you would like to roll back to the previous version of Defraggler Pro (v2.21.993), you can find it here: https://filehippo.com/download_defraggler/70072/. Windows 10 v1803 on an Acer Aspire V5-531 laptop. Hard drive is a Seagate ST320LT020-9YG142. Previous versions of Defraggler correctly identified it, but v2.22.995 says it's an SSD. 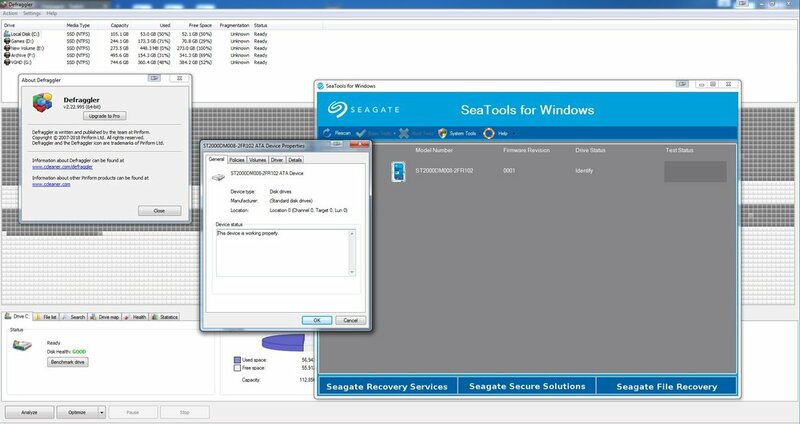 Windows sees it as an HDD, so does Acronis Drive Monitor. Hi this is Robertlaw again. Read my earlier messages above first. Last week I uninstalled Defraggler. It showed at three different times when I defragged my hard drive that my system was 33%-45% fragmented. Which I new to be ridiculous and inaccurate as hell. In five years of using earlier versions of DF, the results have never gone over 8% Plus DF incorrectly states that I have an SSD, which I don't. 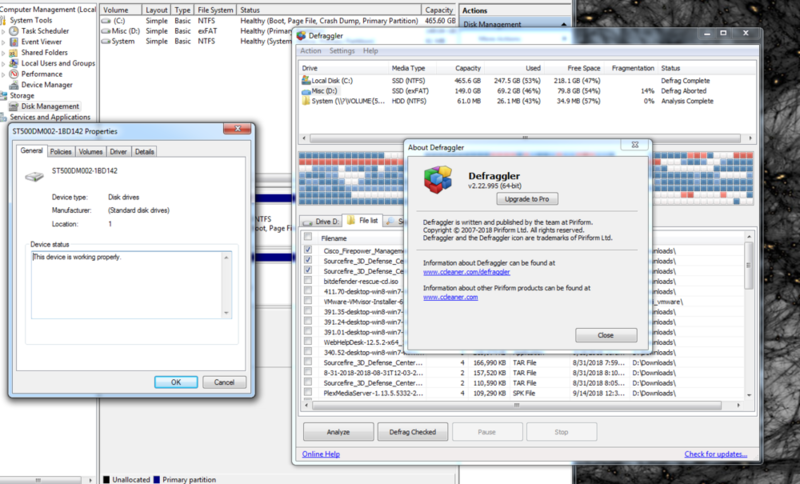 As I stated above, after uninstalling DF, I used the Windows 7 pro defragmenter. It showed 0% defragged!! Anyways, for the fun of it, I just now re-installed Defragger, latest version again. Sure enough, its still incorrectly shows I have an SSD which is untrue. I ran Analysis (and Analysis) only. It says my hard drive is an acceptable & believable 7% defragged! I am not going to run the Defragger! Who the hell knows what damage it could do. This software is VERY SCREWED UP. I advise everyone to skip this version. There are major problems with this. By the way, I am loyal fan of Piriform. I have been using Defragger and Speccy and CCleaner for more years than I can remember!! Know this as well: Both Speccy and CCleaner also wrongly identify my 8 year old 500 GB hard drive as an SSD!!! - Question: Doesn't a SSD and a HD have some information stored somewhere in e.g. the firmware that tells the Piriform's software if the storage device is a SSD or a HD ? - I had some problems with a Hitachi Travelstar drive in the past. The documentation for that HD I pulled up from the interent told me that it contained a 512 byte information string. That documentation also told me what the meaning was of each byte & bit that was stored in that information string. - I have an external USB 500 GB SSD and Defraggler does correctly recognize it's a SSD. Dell desktop running win 7 64bit reporting HDD as SSD. too. Long, long, looonng, running bug with DF and CC. Roll back to Defraggler 2.21.993 (if you still have it or can get it). It identifies them correctly. I have stayed on v2.21 and for my current 2.5" SSD it correctly identifies but for my M.2 SSD it detects as a HDD. Add me to the list !! I got the same problem.. my HDD is reported as an SSD.